Background: Recently high-resolution, noninvasive, multimodality in-vivo molecular imaging with PET, SPECT, CT and MRI, employing fusion algorithms has revolutionized personalized medicine. However, novel discovery of specific radiopharmaceuticals (RPs) for the accurate diagnosis and effective treatment of progressive neurodegenerative diseases such as Alzheimer's disease, Parkinson's disease, drug addiction, and other cognitive impairments still remains a significant challenge. Objective: The primary objective of this review is to highlight the clinical significance of multimodality fusion neuroimaging for the determination of: pharmacokinetics and pre-clinical development of radiopharmaceuticals (RPs); in-vivo monitoring of stem cell transplantation therapy; nicotinic acetylcholine receptors (nAChRs) investigations; and regional cerebral blood flow and glucose metabolism in cognitively-impaired subjects employing multimodality noninvasive PET, CT, MRI/MRS, and SPECT imaging. Method: Recent methodology to perform multimodality imaging employing computer-based fusion algorithms is provided with a primary emphasis on nanoSPECT/CT, PET-CT, and PET-MRI in experimental animals. Multimodality imaging is performed to detect CNS infections using 99mTc-HMPAO SPECT and 18F-FDG PET/CT. Furthermore, limitations of individual neuroimaging system, body movements due to cardiorespiratory activity, and co-registration of multimodality neuroimaging data are described. Results: Multimodality neuroimaging is clinically-significant because it emphasizes the importance of complementary imaging for theranostic applications and minimizes the inherent limitations of individual neuroimaging approach. However, it may increase the radiation dose to a susceptible pediatric population. Conclusion: Future developments in specific RPs with minimum radiation exposure will facilitate early differential diagnosis, prevent, slowdown and/or cure neurodegenerative diseases, cardiovascular diseases, and cancer. 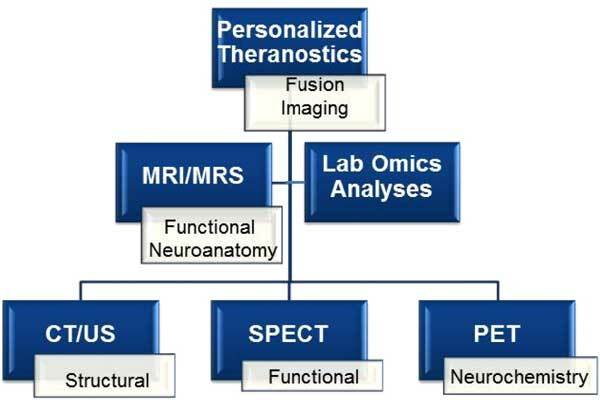 Eventually, conventional and functional neuroimaging, combined with clinical, laboratory and - omics analyses will facilitate theranostics to accomplish the ultimate goal of personalized medicine. Keywords: Computerized tomography (CT), positron emission tomography (PET), magnetic resonance imaging (MRI), magnetic resonance spectroscopy (MRS), ultrasound imaging, radiopharmaceuticals, nanoparticles, personalized theranostics. Keywords:Computerized tomography (CT), positron emission tomography (PET), magnetic resonance imaging (MRI), magnetic resonance spectroscopy (MRS), ultrasound imaging, radiopharmaceuticals, nanoparticles, personalized theranostics. Abstract:Background: Recently high-resolution, noninvasive, multimodality in-vivo molecular imaging with PET, SPECT, CT and MRI, employing fusion algorithms has revolutionized personalized medicine. However, novel discovery of specific radiopharmaceuticals (RPs) for the accurate diagnosis and effective treatment of progressive neurodegenerative diseases such as Alzheimer's disease, Parkinson's disease, drug addiction, and other cognitive impairments still remains a significant challenge.